Learn how to make a hammock, how to set it up, and how to use it both for leisure camping and for survival! A good ‘ol hammock is your best friend while you’re in the rainforest camping, backpacking, or, in a worst-case scenario, trying to survive a zombie apocalypse. Just hang it on tree trunks and treetop branches, and you’ll have a decent survival shelter off the ground. Making a hammock is an important survival skill, whether you’re out there exploring a rainforest or trying to live through a natural disaster. Boost your survival skills by learning to make a DIY hammock or at least set up one. Make sure you have the complete gear before you venture out into the rainforest. Take note, these things must be durable enough to support your weight. To set up a hammock between trees, you need static rope, dynamic rope, and polyester webbing straps. You also need a locking carabiner, throw line, harness, belay device, and of course, the hammock. Next, scout the area for solid, sturdy trees. Hammocks are ‘traditionally’ hung between two trees, which are around 12 to 15 feet apart. Sometimes, depending on the style, you will need three trees, but you can also set one up on just one tree if it is solid enough and has strong branches. You don’t need to climb a tree if you’re thinking of setting up just a little bit off the ground. There are risks when you sleep in a rainforest and hanging it on treetops is one way to avoid them. To ascend tall trees properly and safely, you need to learn some climbing techniques, first. You also need how to rig a tree and how to use the throw line. The trees’ health is affected when you use them to hang your hammock. To lessen friction and prevent any other kind of damage to the trees, you need to wrap their trunk or branches with protective straps. You can even use sticks between the trees’ surface and the straps to avoid further friction, as well. After placing protective straps on the tree’s surface, you can tie or attach the rope to the webbing straps. Sometimes, you only need an S hook to connect the tree straps and the ropes. But if you set one up on treetops, you must use strong knots and good quality carabiners to secure the hammock. Test for the perfect sag and adjust it until you’re comfortable. A 30-degree angle from the rope to the tree is a pretty comfortable sag. When it is hung too tightly, it becomes unstable. You would want to secure a deeper sag to decrease the risk of falling off the hammock. 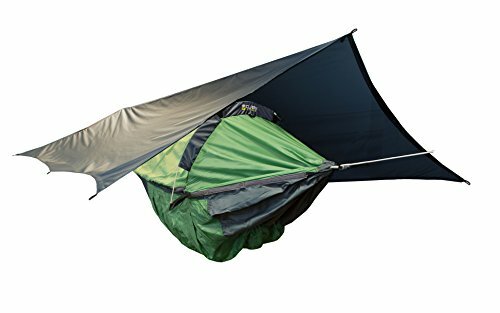 Protect yourself from rain, debris, and cold by placing a tarp over your hammock. Just simply add a ridge line by tying a rope on one end of the hammock to the other end, then pitch the tarp by hanging it on the ridgeline. RATED #1: By Backpacker, Outside and American Survival Guide. Winner of the prestigious Gear Of The Year Award. 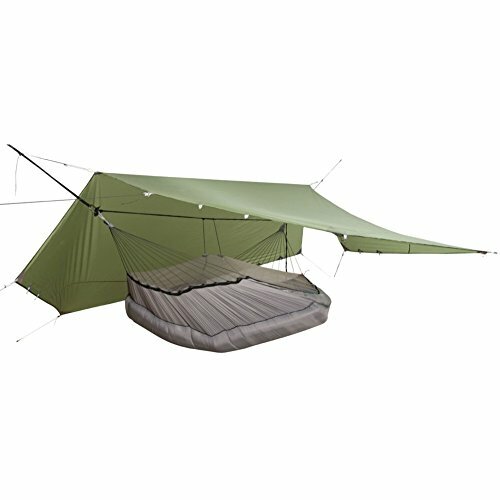 HAMMOCK AND A TENT IN ONE: Patented design with a unique arch pole/spreader bar system that allows for use suspended between two objects/trees as a hammock or on the ground as a tent/bivy. USE ANYWHERE: Most versatile tent hammock in the world. 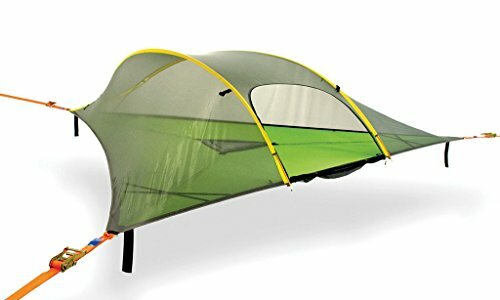 Perfect for all types of camping; car camping, backpacking, bike camping, Scouting, kayak/canoe camping or even lounging bug-free in the backyard. Canvas, a very durable fabric, is popularly used to make sails and has also been used by sailors to make hammocks. That’s why those that are made from canvas are also called naval hammocks. Making a naval hammock is not an overly complicated process and will be a relatively easy DIY project. Good quality ripstop nylon is a pretty durable fabric as well and makes good material to create a hammock. Actually, it has been used to make much of the camping gear sold in stores. What’s great about this fabric is its resistance to tearing. Even if the fabric does get ripped, the tear would not spread easily. What Is Ripstop? A ripstop is a woven material made from nylon with a special technique to the pattern, thus making it resistant to tears and rips. The Tentsile Stingray is a 3-person tree tent that motivates you to explore the whole world. Setting up in 15 minutes next to rushing rivers, on palm tree-laden beaches and in tropical rainforests, our portable treehouse leaves zero footprint behind! Perfect for 3 adults or 2 adults and 2 children, Stingray offers 75 sq. feet of space with an 880-lbs. max weight capacity and a total pack weight of 20 lbs.-all of which hovers over hard, wet, rocky and uneven terrain all year round. Using 3 powerful ratchet straps to anchor to 3 strong trees, this portable shelter is safely secured by heavy-duty industrial webbing, giving you the freedom to establish environmentally-conscious campsites suspended above the earth! Rope hammocks are more suitable for a warmer climate. They take longer to make, especially for beginners. But if you want to channel your creativity, this project would be great for you. If you have spare time, learn how to make a hammock because it’s more than just a DIY project and a hobby. You’re basically cultivating a skill which may come in handy any day during your lifetime! Do you know how to make a hammock? Is there something you can add to this post? Don’t hesitate to share your thoughts with us by writing a comment below! Editor’s Note: This post was originally published on February 7, 2018, and has been updated for quality and relevancy. Interesting rope climbing method BUT how do you get the first rope THAT HIGH up the tree in the first place? I’ve seen it done with much effort with a small sand bag attached to para cord and thrown up over a branch but not that high, and it took a professional tree climber many tries to get it over just the right branch. Then pull the climbing rope and attache as shown in the video.